To Sum It Up: Juliette is now supreme commander of The Reestablishment, ruling over all of the sectors of North America. She quickly finds, however, that the position entails so many more responsibilities than she ever imagined. Juliette also faces a possible threat from the other supreme commanders around the world for all of the upheaval she’s brought upon The Reestablishment, which seems determined to never release its hold on her. Review: The continuation of series after they officially conclude makes me a bit apprehensive, especially when it’s a series that I absolutely loved, like Shatter Me. While what was then the final book, Ignite Me, left a few things unresolved, I was still satisfied with how the series ended. The news that there would be three new Shatter Me books gave me mixed feelings. I would never, ever say no to more Warner, but what if the new trilogy wasn’t as good as the original? 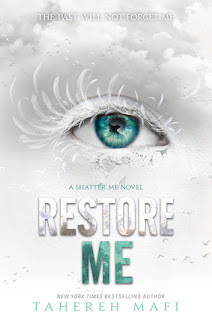 My skepticism was completely unwarranted because Restore Me turned out to be the Shatter Me book I didn’t know I needed. Reading this made me realize how much I’ve missed Tahereh Mafi’s gorgeous prose, Kenji’s hilarious snark, and Warner’s—well, everything about Warner. Since we’re discussing my favorite character in the series, both Warner and Juliette have POVs in Restore Me. EEK. Reading the first page of Restore Me was like catching up with an old friend you haven’t seen in a while. I devoured this book, which is a very, very rare occurrence these days. Restore Me was that good. “Good” doesn’t do adequate justice here, not even close. This was an absolute page-turner that I flew through. While reading the original trilogy, some aspects of the world-building didn’t fully materialize for me, but that didn’t affect my enjoyment of the series. Restore Me fills in some of those gaps, particularly regarding The Reestablishment. The rest of the world’s supreme commanders play a significant role here. We also get a bit of backstory for Kenji and see Warner the most vulnerable he’s ever been. Restore Me is full of revelations that test Juliette and Warner’s still fairly new relationship. I felt for all three of them at various times, but the excerpts from Juliette’s journals that she kept while locked up in the asylum were thoroughly gut-wrenching. Although Restore Me was an intense, chilling read that destroyed me in its final pages, I’m beyond elated that the series is back. Mafi brilliantly and seamlessly picks up her story where she left it in Ignite Me. It’s as though the series never ended, and we’re watching Juliette cope with the aftermath of the events in book three. If you’re at all wondering if Restore Me is worth a read, the answer is an unequivocal Y-E-S.
All in All: My favorite read of 2018 so far! Everything and everyone I loved about the previous Shatter Me books return, but Restore Me is in no way a rehash. The world expands, the characters continue to grow, and the Kenji one-liners are priceless. Even the covers for the novellas are amazing, lol! And both the novellas and the novels definitely live up to their covers!